Pointless Pinning? I think not! So holiday time obviously means more cooking and family time!! I feel like lately Pinterest has been BLOWING up with all kinds of holiday treats and yummy looking pregnancy craving items a.k.a. I’m on cinnamon roll overload (can’t stop, won’t stop!) and I’ve been on it so much looking for new stuff to try!! 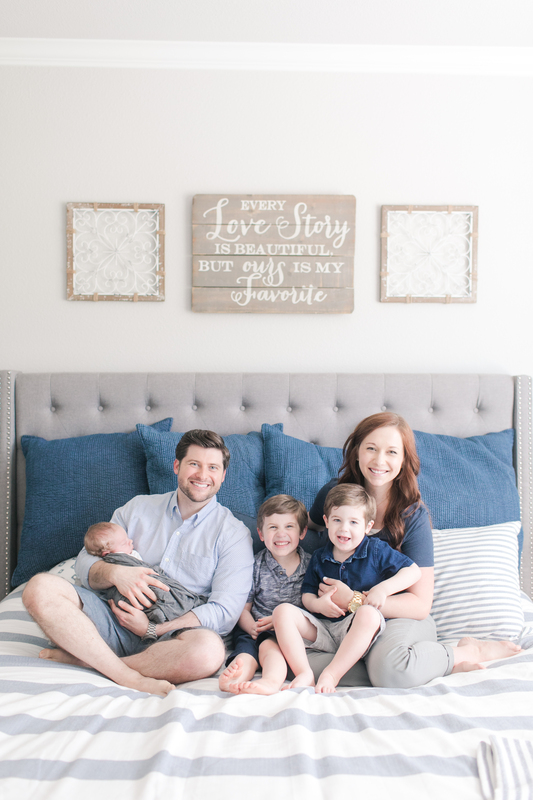 I’ve really been trying lately to try more of the “pins” I have pinned on Pinterest, because I mean really, if I’m not going to do anything with those pins it’s kind of pointless to sit around pinning stuff, right?? Haha, no, really I’m just trying to be better about cooking for my family and trying out some new things. So I just thought I would post about some of the recipes I have tried lately. Some I have pictures for but some I don’t, mainly because who has time to snap a shot when you have a hangry little toddler pulling on your pants leg!!?? ;0) Let me know what you think, most of these things were very easy because easy and tasty is what we aim for around here!!! 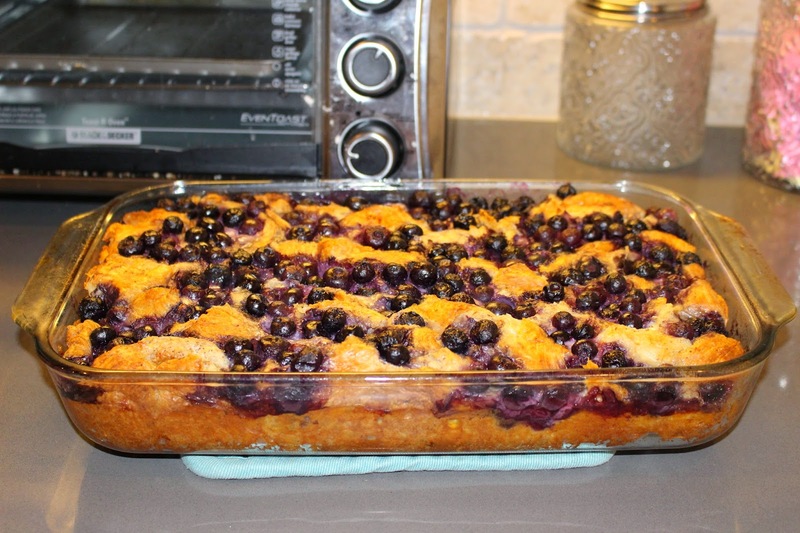 So I love breakfast casseroles, but I feel like between just my husband and I it is hard for us to eat the whole thing before it gets weird and soggy, so I tried out this yummy blueberry french toast casserole I got from Mix and Match Mama’s blog while my parents were visiting, and it was super easy and tasty! Only thing I might do differently is add a little more vanilla and maybe sprinkle a little sugar on top, because sugar makes everything better, right? And surprise, surprise, I have an actual picture of this one!! For our family Christmas get together, we did BBQ for our meal this year! I made my first brisket and was soooo proud!! I used a pioneer woman recipe and it was SO easy and SO delicious! I couldn’t believe how well it turned out with such little prep on my part! Of course, lots of praying went into it because I was afraid we would have to resort to my back up plan of pizza from Sals down the street, so maybe that helped too! I hate it that I did not snap a shot of this bad boy!! We also made some BBQ pulled pork, which again, was SO easy! My hubbie said it was definitely a repeat for dinner! We enjoyed this on Hawaiian rolls but you could also put this on a yummy baked potato with toppings!! Literally, all you do for this is buy the pork loin, place it in the crock pot, pour root beer on top and cook for 6 hours! Then pour off the root beer and shred it, and then add your favorite BBQ sauce on top and keep on the warm setting for another 30-40 minutes. Tada! Dinner’s ready! We did some other sides like baked potatoes, baked beans etc. but we also did some roasted corn that I just think is the most fantastic thing ever and worth the little extra time! So much better than boiling on the stove! Just peel back the corn husk, pull out the silk and add some butter, salt and pepper. Push the husk back up, wrap them in foil and then grill for about 30 minutes, rotating them occasionally. So around the holidays I get a hankering for all things sweet and full of carbs so this next one really hit the spot. 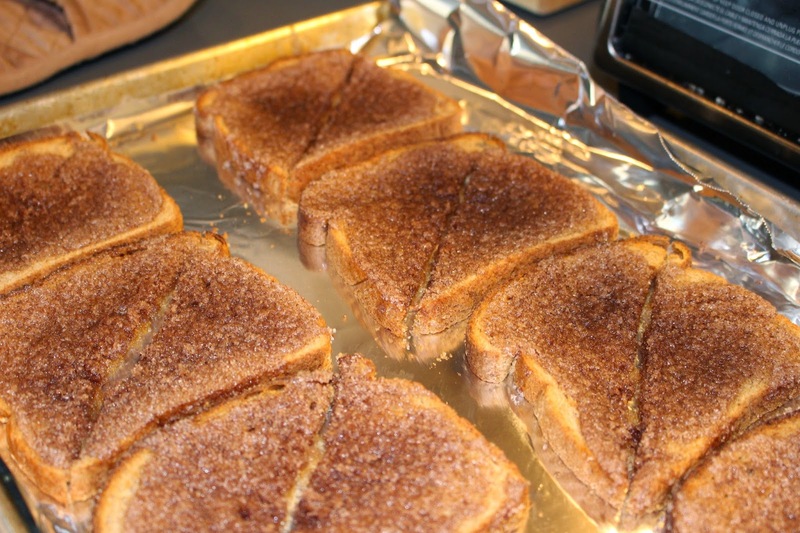 I’m definitely a fan of Pioneer woman and thought she had a cool spin on good ol’ fashioned cinnamon toast! Made it this morning for breakfast! Of course the big man of the house and the little man approved! 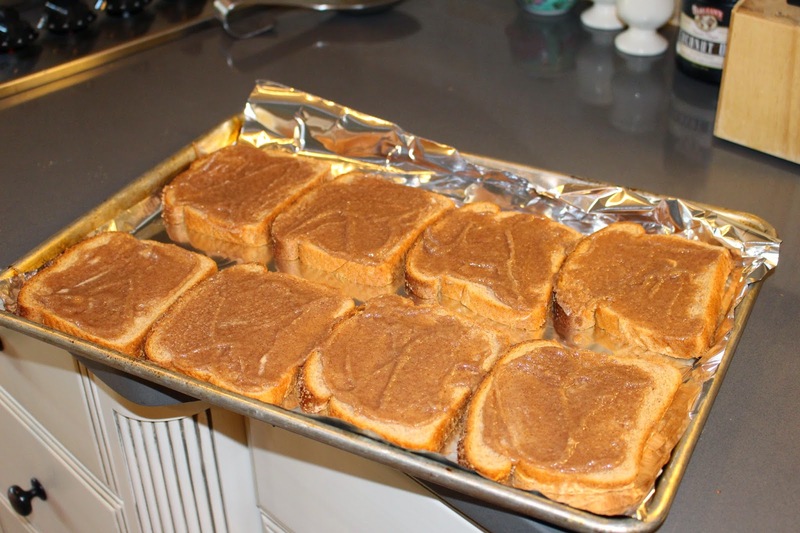 She has you soften a stick of butter and then mix in the sugar, cinnamon and vanilla with the butter, then slather (yes… slather) all over the bread and pop it in the oven. Easy and will definitely provide you with that sugar high we all appreciate occasionally in the morning. 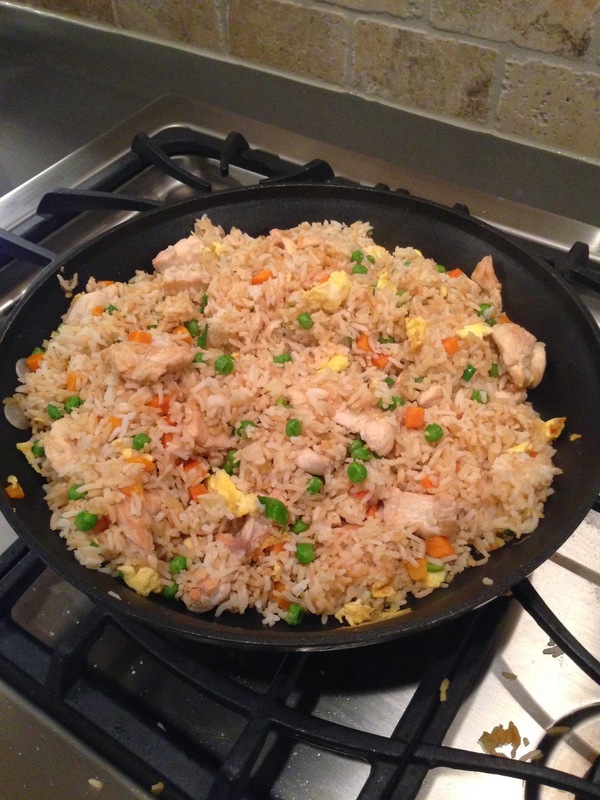 A couple of weeks ago, my friend Jessica sent me this pin for chicken fried rice. It was super good and even good left over! 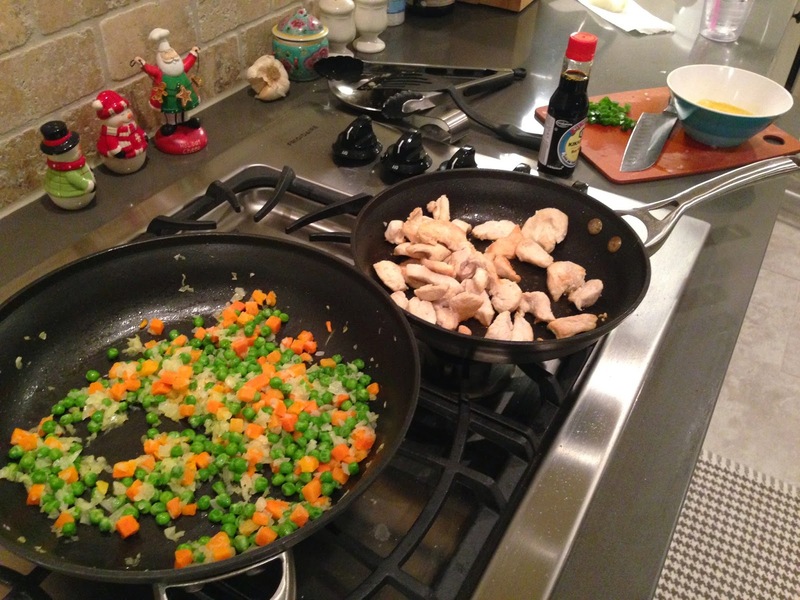 We substituted coconut aminos for soy sauce. Tt has lots of good little things in it like peas, carrots and chicken if you have any little fingers around at the dinner table! Of course my son decided just to smash the peas and carrots the night I made it… made me so proud, just the epitome of health at times hehe! 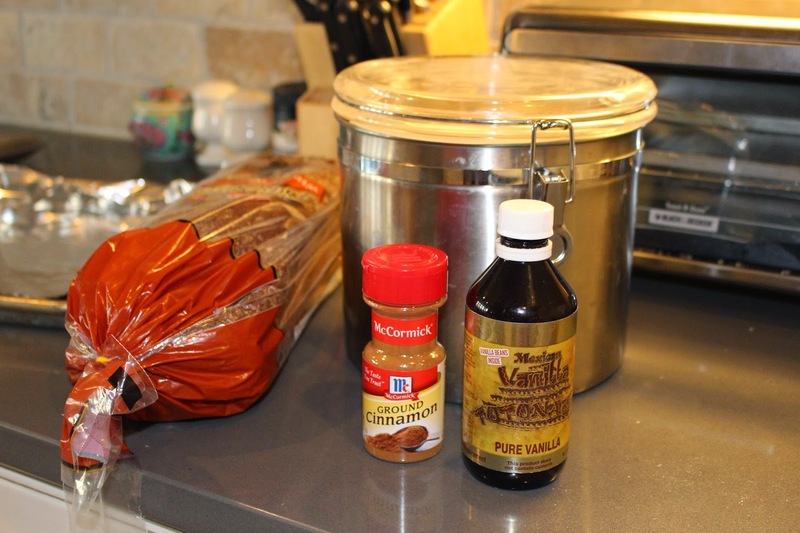 In addition to my cinnamon roll obsession (those recipes are in the works for next week! ), I’ve also been craving soup like non stop. I know, thank you weird hormones! So I tried out this tomato basil soup and it was delish! I got some gouda cheese and toasted it on nice fluffy bread from the HEB bakery and it was yumsters along with this soup! This soup made me miss my garden so much! I could have just walked into my backyard and gotten almost everything I needed! Maybe again one day! We have also had some post thanksgiving congestion, so of course, chicken noodle soup! 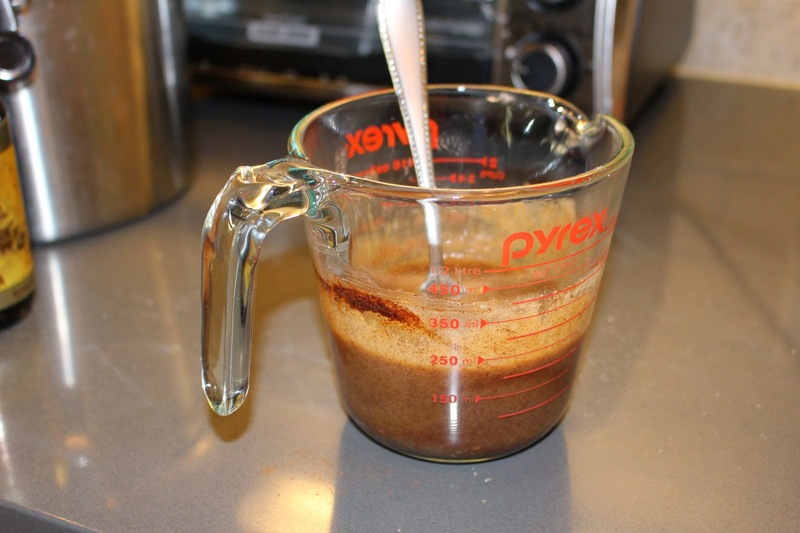 This was a pretty good recipe, it wasn’t too difficult and had a nice flavor to it. I know this is getting long and out of control, but just a couple more! These oven tacos are super easy and tasty! Kind of a different twist on taco night! Just add a couple of sides, some spanish rice and guacamole and you are good to go! 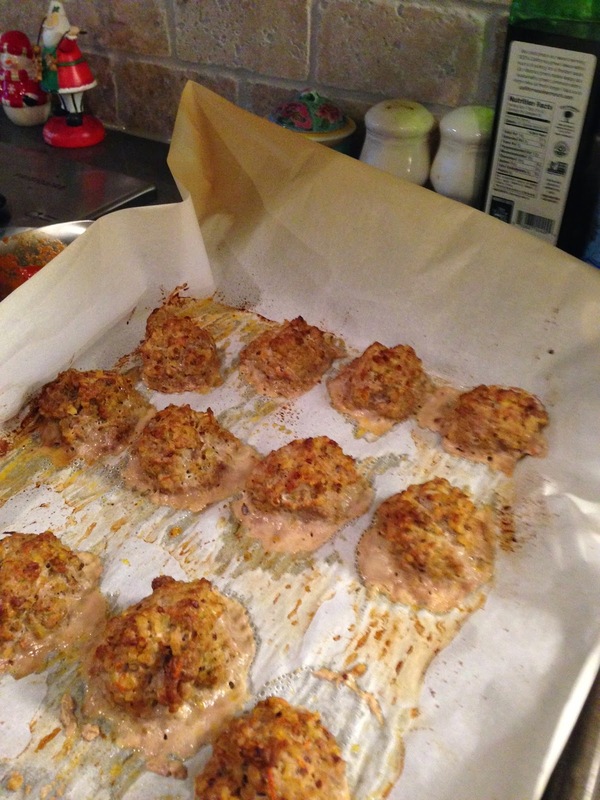 And last but not least, another awesome recipe from my friend, Jessica! 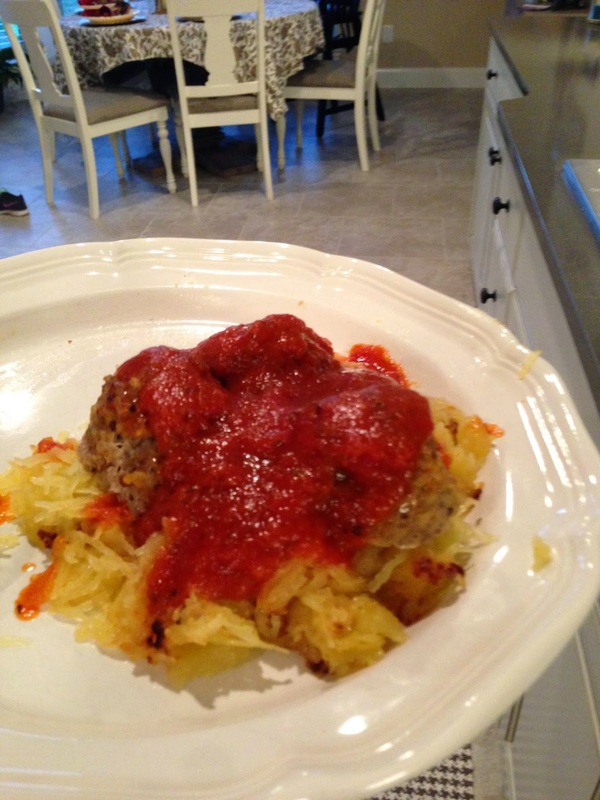 These meatballs are the bomb and SO good on spaghetti squash! 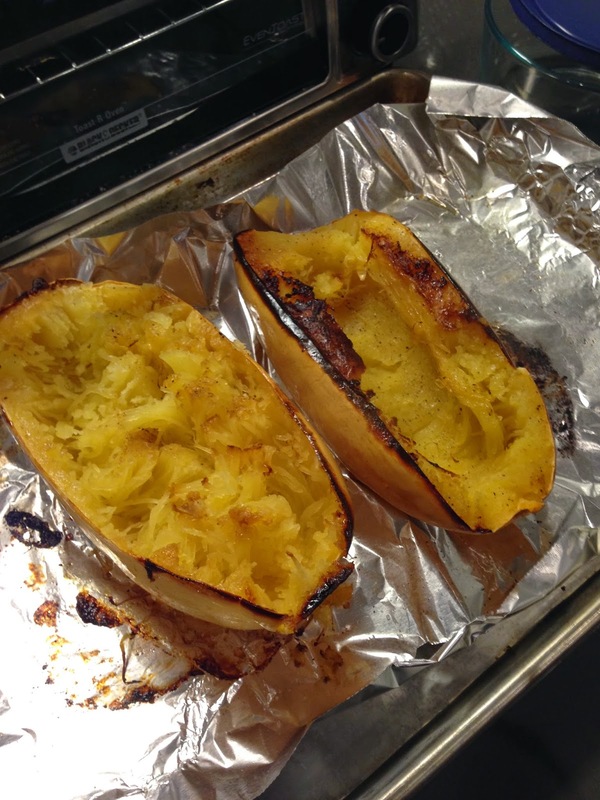 This was the first time I had cooked a spaghetti squash and it definitely won’t be the last! 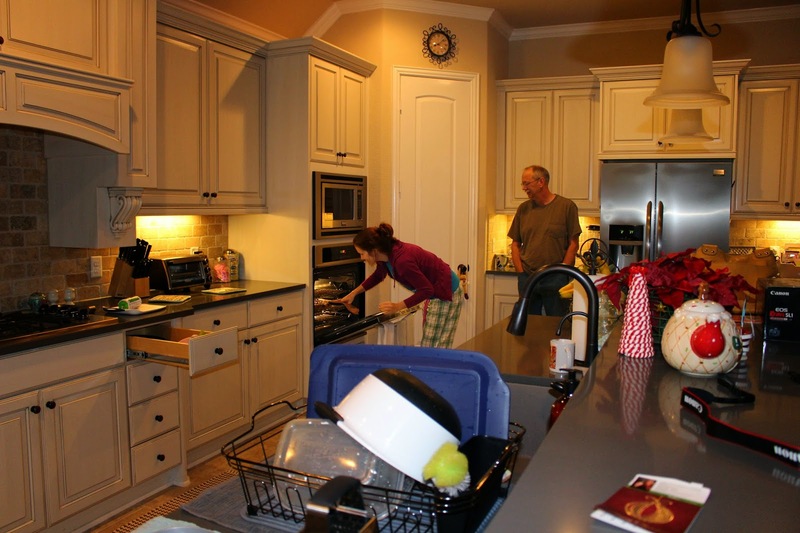 Jessica says that she will double the recipe and freeze them, so easy meal to eat later! These guys are great because they have some hidden veggies in them for any picky eaters you may have in the house! Again, easy and tasty meal! And definitely go for the spaghetti squash with some marinara on top, you won’t be disappointed! Previous Easy Chicken Spinach Parm and Zucchini Fries!